As part of Tree Week our Horticulture students planted a native birch tree in the grounds of C.S.N. Many thanks to Ms. Casey & Mr Skally for organising the planting. One of our T.Y. Business classes paid a visit to Musgraves’ on Thursday 4th April. They were given a tour of their facilities (including the chilled warehouse) and had the chance to speak with employees in various departments. Daniel Kearney, (Cork senior hurler) a financial analyst with Musgraves’ also met with the students and explained how Musgraves’ operate their business. The boys really enjoyed the visit and really appreciated the opportunity to visit such a large local company. Our T.Y. students attended an Open Day on Tuesday 2nd April in C.I.T.
Part of the visit was a talk which provided them with an overview of all of the courses available to them. They were then invited to view all of the departments exhibitions and to speak to the lecturers and current C.I.T. students about the courses. It was a very worthwhile experience for our students as they are at present choosing their academic subjects for the Leaving Certificate. The Lord Mayor, Cllr. Mick Finn returned to Coláiste an Spioraid Naoimh to present Munster Council certificates to Transition Year students. Over the past few months, Mr Johnny O’Sullivan (parent of past pupils John, Declan, Paul, Brian & Kevin and Grandad to present pupils) has run a practical course in hurley repairs. 19 students completed the course this year. The Lord Mayor encouraged the students to use the new skills that they have acquired to get part time work repairing hurleys in their clubs. On behalf of the students Matthew Nason responded to the Lord Mayor and thanked him fro taking time to come to the school and assured him that past pupils were already using their skills repairing hurleys to make money for college. Mr Foley & T.Y. student Ryan Baker paid tribute to Mr Johnny O’Sullivan’s commitment to the school and thanked him for sharing his expertise with the boys. Mr Walsh introduced the recipients of the Munster Council certificates to the Lord Mayor and he presented their awards. The annual Transition Year French Exchange trip is underway this week. Our host school is Lyceé Saint Saveur de Redon. Redon is a commune in the Ille-et-Vilaine department in Brittany in northwestern France and C.S.N. students have had the opportunity to visit there over the past number of years as part of our French Exchange programme. Our students and their teacher Ms. Walsh are having a great time with their wonderful hosts and have been to visit St. Malo & Mont St. Michel. They have tried out kayaking they have also paid a visit to the Mairie (Town Hall). On Wednesday zip lining was the highlight of the day and for some it was a new challenge which they thoroughly enjoyed. They spent the evening in the gorgeous old port of Redon. The boys have had a fantastic week and huge thanks to their wonderful host families and to all of the staff in Lyceé Saint Saveur de Redon. We are looking forward to welcoming the French students to C.S.N. very soon. Congratulations to our 3 Mini-companies. They had a fantastic day at the Cork Schools Enterprise Programme Christmas Trade Fair in Blackpool on Thursday 6th December. Best Overall Company – “The Rook” which is a Health & Fitness company focusing on promoting a healthy lifestyle to teenagers. Best Market Research – “BeoSaol” which is an online site that will provide information and services for the elderly. Best Sales Plan -”Eventi” which is an entertainment management service. A one-stop shop for performers and audiences. They hope to develop an “app” as part of their long term plan. Our annual Readathon was held on Wednesday, 21st November. It was organised by our Transition Year students for all 1st and 2nd Year students. It was a very successful event and sincere thanks to parents for their very generous sponsorship. 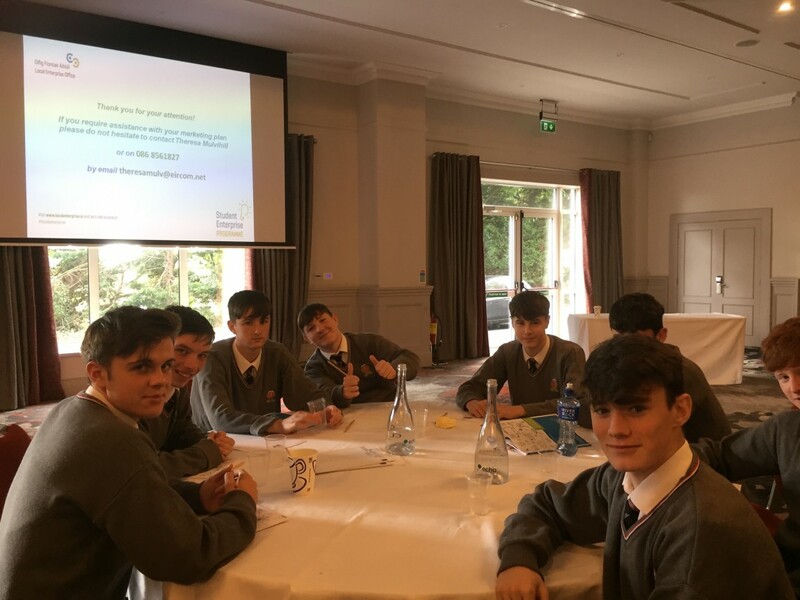 A group of TY students in Mini Company recently attended an Innovation Day for young entrepreneurs, organised by the Local Enterprise Office. This is the first day of the year long young enterprise programme organised by the L.E.O. and helped the students in business planning and in idea generation. Mini Company is a very popular and dynamic activity for Transition Year students where they learn to set up and run their own businesses under the watchful eye of the teacher and with help from the L.E.O. Congratulations to six of our Transition Year students. They took part in the U.C.C. PsychSlam 2018 competition and were placed 3rd overall. Psychslam is an annual competition for transition year students held in U.C.C.’s main campus to give students a taste of University life, a chance to explore the environs of the college grounds, and the opportunity to speak with current staff and students of Applied Psychology. Students explore fun and interesting psychological topics ranging from the neuroscience of love to the nature of online friendships, and gain valuable experience in public speaking and scientific communication. The Enterprise Board held its Innovation Day in U.C.C. this week. More than 40 mini- companies from schools across Cork City and county set up their trade stands,. “Get Healthy” (Peter Kelleher CEO), “EXCL” (Joey Harrington CEO), & “Flashback Inc” (Aidan Mamo Cooney CEO). EXCL took first place as “Overall Best Company” with their specialised boot bag, while Flashback Inc took first place in Market Research with their front pages from the past. Well done to all of our students for their endeavours and hard work.